In the parable that Jesus told, the servant who had been forgiven so much, became very angry, and seizing a poor man, who owes him a few dollars, by the throat, he cried "Pay back what you borrowed or I shall throw you into the prison-house and keep you there until you do!" NE DAY SIMON Peter came to Jesus and asked, "Lord, how often shall I forgive my brother if he sins against me and then asks my pardon? Shall I forgive him seven times?" Perhaps Peter did not have much patience with a man who would sin against him often and always ask to be forgiven. Perhaps he thought no person could be truly sorry for his wrong-doing if he should have to ask so many times to be forgiven. But Jesus replied, "I do not say that you shall forgive him seven times only, but seventy times seven." Then the king said, "Because you can not pay me the money you borrowed, I shall command that you and your wife and your children be sold, and that all of your property be taken away from you. In this way I can regain some of the money you borrowed and have lost." The servant felt very sad when he heard these words, and he fell on his face before the king crying, "O King, have patience with me and I will pay every penny I owe!" And because the king had a kind heart he felt sorry for the man. He told him to rise up and go away to his own house. He said, "I will forgive all the debt, and you need not try to pay it back. After this servant went out from the king's presence he met a very poor man who had borrowed on a few dollars from him. He asked the man to pay it back, but the man could not. Then the servant became very angry, and seizing the poor man by the throat, he cried "Pay back what you borrowed or I shall throw you into the prison-house and keep you there until you do!" Then the poor man fell down at his feet and cried out, "Have patience with me, and I will pay every penny I owe." 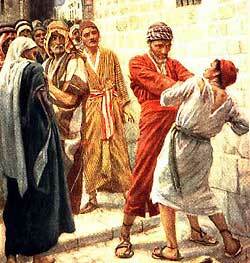 But the king's servant would not listen, and because the poor man had no money he threw him into the prison. The king was surprised to hear that his servant whom he had treated so kindly should dare to be so unkind to another. So he quickly sent for him. Now the king, too, was angry, and when the unkind servant came in he said, "O wicked man, I forgave all your debt because you could not pay, and now should you not have been willing to forgive the small debt your poor neighbor owed? Because you have dared to be so wicked after I had pity on you, now I shall cast you into the prison-house until you pay all you owed me in the first place." When Jesus finished the story he said to Peter, "My heavenly Father has forgiven your great debt of sin; but if you refuse from your heart to forgive the wrong-doings of those who sin against you, neither will my heavenly Father forgive your great sins against him."